i guess i haven’t written here in a while. life has just been moving so fast lately. to those asking if/when we will restock merch, that will be happening soon. both tees and hoodies. the new album is coming 01.06.19 and i think it’s the most positive, encouraging album we’ve ever made. thanks for staying patient. all love. there’s a light inside of you. don’t ever let someone take that away from you. if they tell you that you can’t, show them you can. if they make fun of you, keep having fun somewhere else. if they make you feel down, just keep looking up. if they tell you you’re not a real artist, cover this world in your paint. there will always be people in this life who seek only darkness, who don’t want anyone to be seen… or to be felt, except for themselves. show them the light inside you. be a beacon of what is right. be the light that guides others to shine theirs. inspire vision in this world, and always be unapologetically… you. woke up to news this morning with a heavy heart. i’ll never forget when i saw mac for the first time live in austin when i was only 16. the internet opened up for him, followed by chance, two of my favorite artists today that i hadn’t even known yet until that night. mac came out to nikes on my feet with so much energy, the room shook. was one of my favorite concerts as a teenager. he may not written about the happiest of things in the past (something i could relate to at the start of my songwriting career), but on his last two albums i could tell he was on a path of redemption and brighter days. his last performances had been so jazzy and joyful… i wish i could’ve continued to see his progression back into happiness and maybe caught one of his shows again. thank you for your creativity and inspiration mac miller… may you rest in peace upstairs with a smile knowing that your artistic presence inspired us all. one morning in houston not too long ago, i opened my blinds to a painting of the sky… so i went to lay at that hill i would always go to write and got to catch the colors fall down over the horizon. i brought my uke out there just to jam and write and ended up writing the lyrics for what was to become heaven falls and slipped into some jack johnson after. for some reason that morning i kept messing up the chords to banana pancakes and ended up accidentally falling into a new chord progression that eventually became a separate song, fall on me. when forrest came to visit in houston, he started adding more acoustics to the progression of fall on me, and we made a little one minute track. after recording them separately, we thought the 2 songs' vibes didn’t exactly match, but we had the idea to make a crossover song with them. hearing it today, we wouldn’t have wanted it done any other way. its crazy how it all came together… i’ll never forget that day on that hill. i love those types of mornings… watching the sun rise. it always feels like heaven is falling on me in those moments… so we hope it makes you feel that way too. heaven falls / fall on me is out now. we ended up recording an acoustic version of kid kingdoms with a ukulele while we were in hawaii. i had played the chords for forrest back in houston and we had thought to record a whole acoustic ep while we were out in hawaii. when we heard a band there play ‘somewhere over the rainbow’, we noticed it was the same chords… it all felt full circle. we may be back home, but when i close my eyes and listen to the new version… it feels like i never left. hawaii has been a dream… the sun feels so different out here. i think someone has been secretly dyeing the water blue… the shade of it is unreal. there’s a storm nearby that made for what the locals are calling ‘king tide’ which has been making some pretty crazy waves for us to surf. we brought a uke and a guitar looking to possibly record some acoustics out here but it would be a sin to stay inside for any part of the day when the sun was still up. we got to see most of the marine life on the island on a catamaran we took the other day and we hiked the diamond head trail yesterday and caught a breathtaking overlook of honolulu. today we’ve been on a road trip to north shore with the windows down just exploring beaches and art shops. these experiences make it so easy to write. i can feel the sun leaving my pen. forrest came to visit in houston. we’ve been making a lot of progress on the new album. we leave for hawaii in a few days to go record out there too. life feels like a movie. 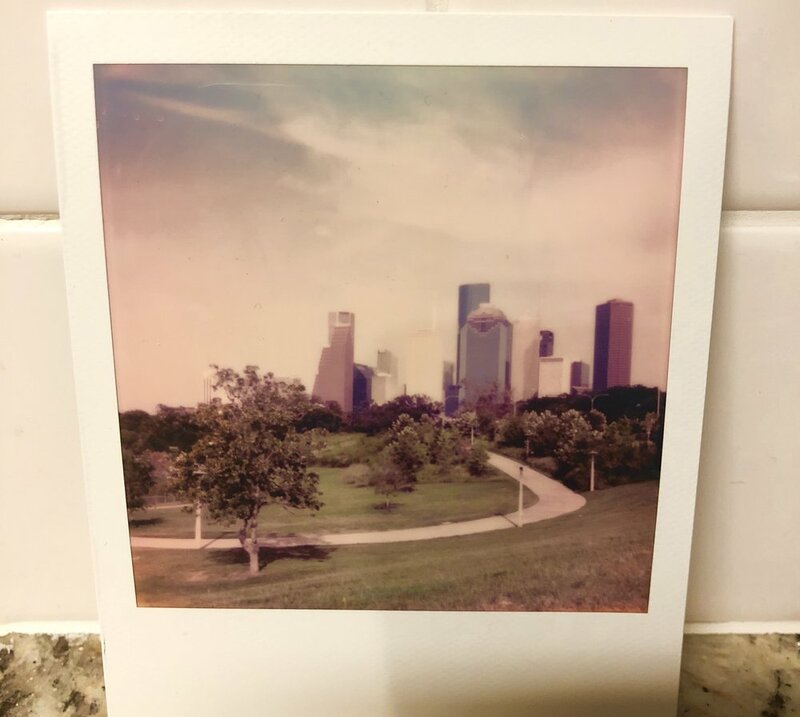 i found a hill with someone the other day that overlooks the houston skyline. i come back some days just to write. i think it’s becoming one of my favorite places. i’ve caught a few sunrises... some sunsets too. the colors look almost painted some days... as if heaven was falling. i took a job out in houston for the summer. it’s the first time i’ve ever lived alone by myself. i never really understood what forrest really meant when he said you learn a lot about who you truly are when you live alone. i knew it was hard for him to move out to seattle on his own, but i could never truly grasp the reality of it until i did it myself. it’s always been hard for me to be by myself... i usually feel lost without anyone around. coming home to music never felt like more of an escape until now. i put a studio in my living room in front of a big glass window... just close enough to feel the sun. when the light shines through while i’m writing music... i don’t feel so alone. i’ve been in seattle for around a week on what was supposed to be just a bunch of recording sessions with forrest for the second album. we we’re trying to force music out as soon as i got here and ended up realizing that it wasn’t the right way to go about it. with surf, it just seemed to come so naturally... nothing felt forced... we just had a story to tell. now, it just feels like we’re at this make or break point... to where people are actually listening... so what do we really have to say? why are we here? why should the music matter? instead of continuing to force writing and recording... we kind of just put music on pause and ended up experiencing life for a couple of days... feeling the light of day outside. after a few long nights of deep conversation in the houseboat about the good times and the dark times in both of our lives... we found a message worth sharing... something worth writing about. it was like a piece of God was in the studio with us telling us where to go with not only the album... but with our lives. i’ll never forget waking up that next morning. i ended up finishing the album art in the kitchen. i had shown forrest this picture i had been slowly drawing for a few weeks but didn’t know what it meant or what colors to use in it. but that morning... the light came in through the kitchen window... and the color spilled everywhere. in a room full of darkness... i found the light within myself. we released our first music video today. it was shot on one of the most beautiful days we've seen in seattle. it was special to get film where surf was born. most of the shots in the video were the places where we had hung around in between studio sessions when we we're making surf. i'm glad we were able to capture the beauty of the place that had influenced the album so much. like with surf, i'm really proud with how the video came out... it's something that we'll be able to look back on with nostalgia for the rest of our lives. i wanna thank taylor smith and storm productions for helping us bring the vision we had for this song to life. in a world that's riddled with judgement and hate... we hoped to spread some love and unity with this one. we hope you enjoy. as she would admit it herself... cooking was never my mom's forte. she was never your stereotypical home-made cook style mom. she may not have had the cookbook on food down, but i'd like to think she wrote the book on my remedies. she always reminded me that in order to learn how to get up, you have to fall down. so when forrest first came to me with the skeleton of low, i connected with the song like crazy. i told him we have to put the pieces together and finish it. for weeks, it was all i could ever think about before i flew to seattle to finish recording it with him. we've always been good at writing songs with each other. even before we started surfaces, it’s like our lyrics were always talking to each other in different perspectives. we might be 1800 miles apart, but we always somehow connect on songs with what we're both feeling at the time. what started as just a song about feeling down, turned out to be a song about acceptance and perseverance. a song that lets people know that it's okay to feel low, it's okay to yell it out. accepting your lows is always the first step, but what you do from there is what will always define you. low is out now. enjoy. i'd make it a movie and put it on loop"
a year's worth of memories and stories. ready to be told. made it out here to seattle again to wrap up the album. i feel like i learn so much about myself every time i come here. a home away from home. we built a fire tonight right off the coast and reminisced about the album and where it’s lead us. i’ll never forget this journey.